Dear Mr. O'Leary, Thank you for voting for me in the 1923 Baseball Contest. I tried hard all the way and especially for a whole lot of Boston friends from the old days. I'm not going to quit trying, there's a lot of years ahead and I'll do my best to make them good years. Sincerely, Babe Ruth. Both the text and Ruth's signature have been boldly executed in black fountain and grade "9/10." However, a stain in the lower right corner affects most of Ruth's last name, resulting in it being lighter than his first name (still clearly legible). 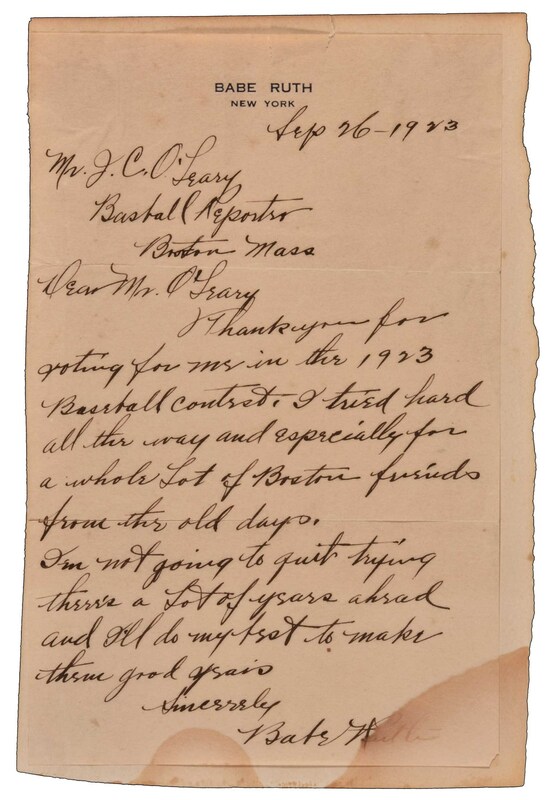 This letter originates from the estate of James O'Leary and was discovered approximately fourteen years ago by a family member in one of O'Leary's scrapbooks. The scrapbook, which was presented to O'Leary by members of the Baseball Writers Association at his 75th birthday party (held at the Copley Plaza Hotel in Boston on September 14, 1936), had been in storage for decades when our consignor decided to leaf through it in order to determine whether it should be discarded. Luckily, he immediately realized the value of the Ruth letter and began contacting auction houses. The family eventually chose Sotheby's to sell the letter, and it appeared at auction in 2005 but failed to meet the reserve. 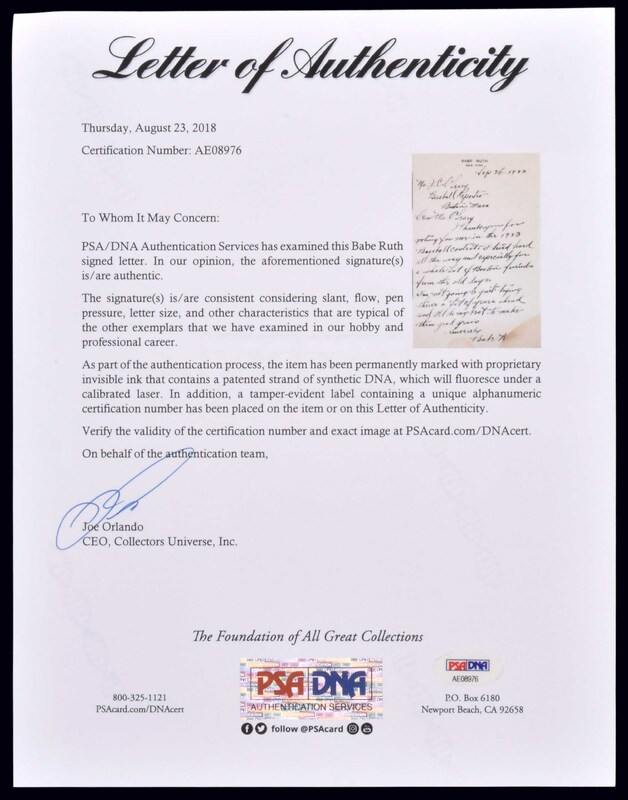 Now after thirteen years, the family has once again decided to part with it, and REA is proud to have been chosen to offer this important letter to the collecting community without reserve. Ruth handwritten letters are the exception rather than the rule and this is one of fewer than ten examples we have seen. It is also one of the earliest Ruth handwritten letters we can recall. 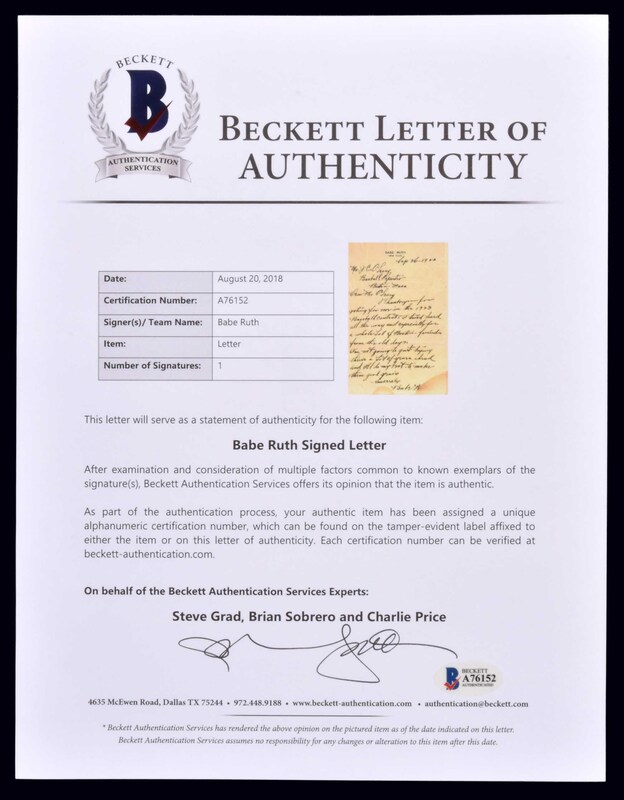 The fact that it dates from his one and only MVP season, and specifically references that MVP Award, makes it one of the most significant Ruth letters imaginable. While it might seem strange to many that Ruth only won one MVP Award during his illustrious career, the rules in place at the time mandated it. From 1922 to 1929 the American and National League each recognized its own MVP, but the rules of voting were different for each league. Most important, the American League did not allow past winners to be eligible for future consideration. The illogical nature of that rule was never more apparent than in 1927, when Ruth hit a record 60 home runs but was not listed on the American League MVP ballot. Eventually, that rule was changed in 1931, when the MVP Award for both leagues was officially voted on and presented by the Baseball Writers Association. Ruth certainly deserved the MVP Award in 1923. The fabled "Sultan of Swat" once again led the league in numerous offensive categories, including home runs (41), RBI (130), slugging percentage (.764), on-base percentage (.545), and runs (151). His batting average of .393 was second only to Harry Heilmann's .403. Ruth's batting exploits helped lead the Yankees to their third consecutive pennant and first World Championship in franchise history. The letter (5.5 x 8.5 inches) is affixed to an album page that has been trimmed to just slightly larger dimensions (6 x 9 inches). The letter displays two horizontal mailing folds and the aforementioned stain affect the lower right corner and smaller segment near the middle of the bottom border. 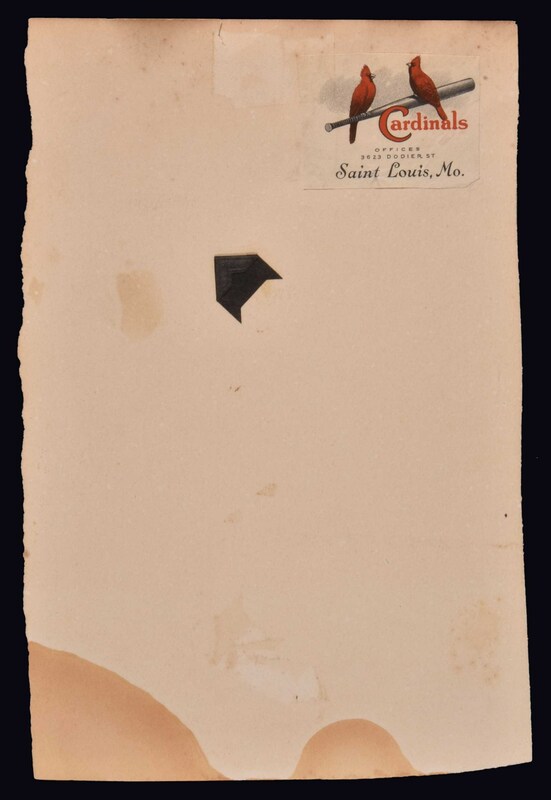 A portion of a St. Louis Cardinals letterhead is affixed to the reverse of the album page. 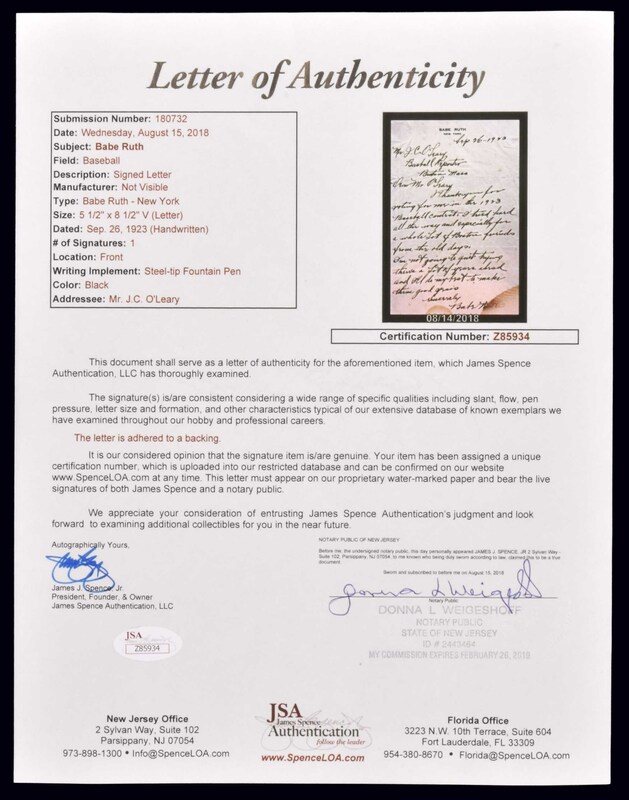 Full LOAs from PSA/DNA, James Spence/JSA, and Steve Grad and Brian Sobrero/Beckett Authentication Services. Reserve $5,000. Estimate (open).